Chris & I reached Singapore at 10.12 pm. We alighted at Beach Road, just next to the Beach Road Hawker Centre. We went for a drink before walking towards Jalan Sultan to hail a cab. As we were approaching the bus-stop outside Keypoint, Chris & I saw a cab on the opposite road with its 'For Hire' light on, it was about to make a U-turn. Chris wanted to wave to the cab but I already saw a couple who were at the bus-stop, hailing it. I turned to tell Chris & before I could finish my sentence, I heard a loud crash. 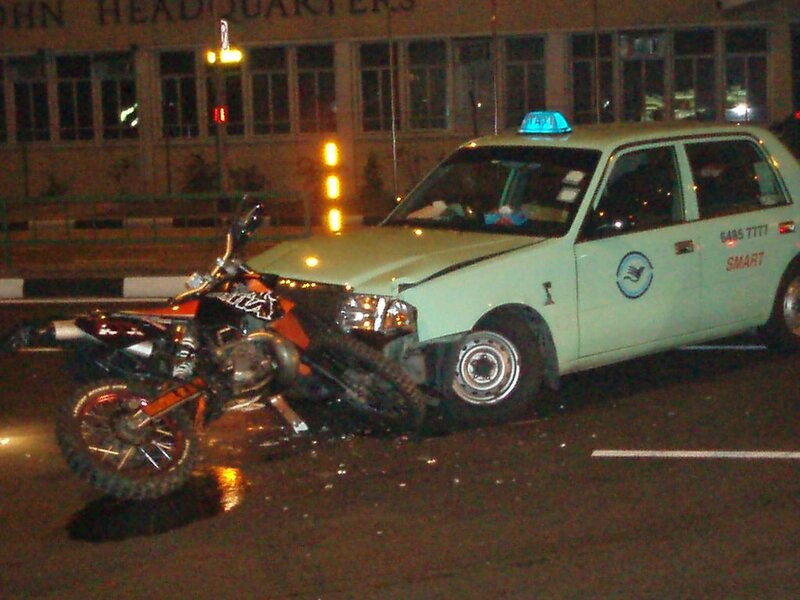 I turned round & was horrified to see the taxi had already rammed into a motor bike. Two men were laying on the ground, writhing in pain. Instinctively I ran towards the motorcyclist asking if he was okay. He was in shock & gasping, he finally managed to let out an audible "How's my friend?" He tried to sit up but I made him lay down while I checked on his friend. I turned round & ran to his friend who was also in shock. He was flung about 3 metres from the bike. He stared blankly at me when I asked him if he was okay. There was blood on his nose & mouth. There were cuts on his knuckles. He complained of pain in his left knee. Someone was helping to remove the helmet from his head. By this time, a few people had come to help. Chris made me wait at the kerb with our luggage while he & an unidentified elderly man helped to divert the oncoming traffic. 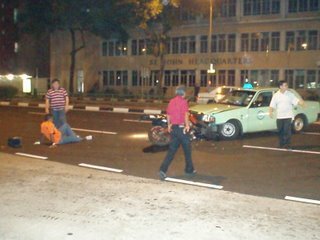 Another 2 men helped the injured pillion rider to the bus-stop because he was lying right in the middle of the moving traffic. 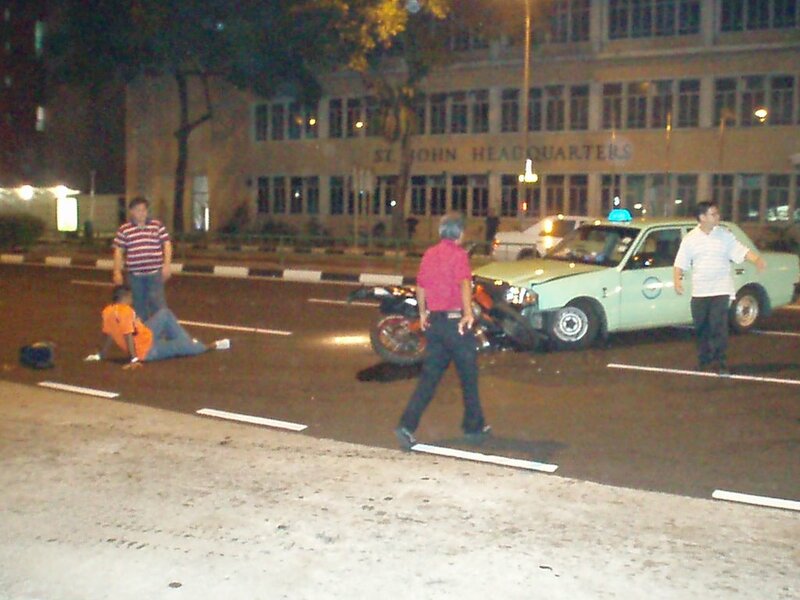 The taxi-driver also came out of his vehicle to check on the motorcyclist. 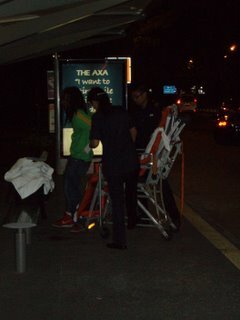 The young couple who was hailing the taxi involved in the accident, flagged down a passing taxi & fled. The young man did try to help the injured but his female companion dragged him away. More people had gathered around the accident scene. Vehicles slowed down so drivers & passengers could gawk at the injured man laying in the middle of the road. Within 15 minutes, the ambulance arrived. The paramedics checked on the motorcyclist first. They made him stand up & walk. He was fine. Then they turned to the pillion rider. They cleaned & dressed his wounds. When the man complained that his ribs hurt & he couldn't walk, they brought out a stretcher & decided to send him to the hospital for observation. Two policemen had then arrived at the scene on their motor bikes. They assessed the scene & talked to the parties involved. Chris was standing at the other end of the road, alone, still diverting the traffic. The policemen starting taking statements from the agitated motorcyclist & frightened taxi driver. Chris came back. We didn't have to give our statements because we didn't see what actually happened. We left in another taxi. Good job! I'm glad that you stayed to help. Good for you. As long as you don't do anything which could further harm an injured person, you are doing good. I've had all too much experience seeing (and being in) car accidents and don't like that mode of transport much. Motorcycles even less. It was so scary. Everything happened within a few seconds! The two guys were in shock. But I was glad people came to help. 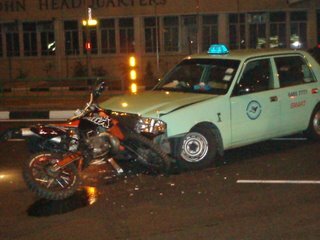 The taxi-driver, although frightened, did not shirk his responsibility. He called for the ambulance immediately.